Deutsche Post - Small Package (slower): for small and less valuable items. 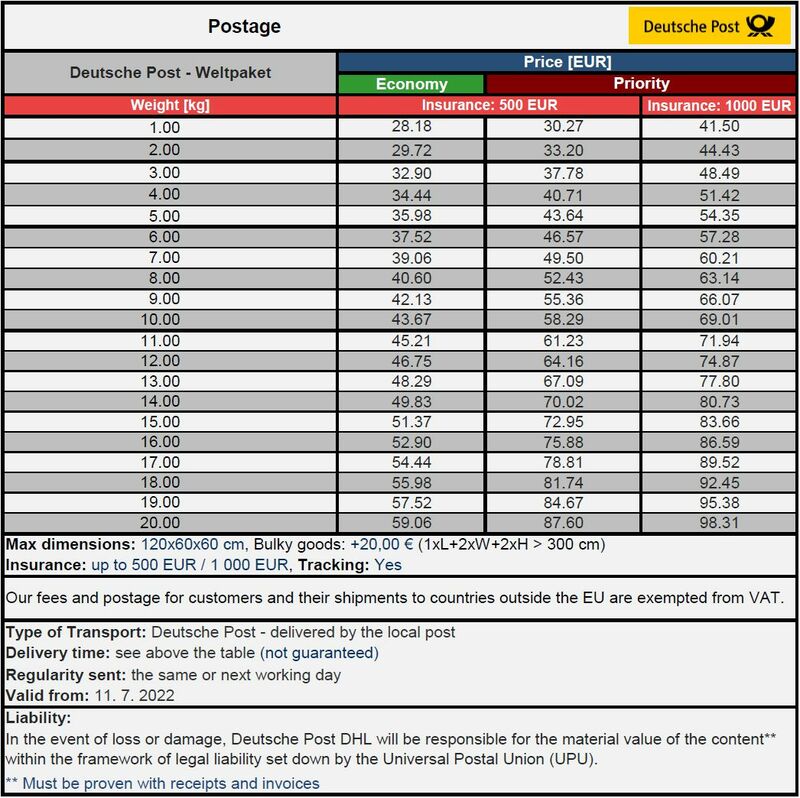 Deutsche Post - Weltpaket (economy - slower, priority - faster but not express): for valuable items with the requirement to send faster (priority). 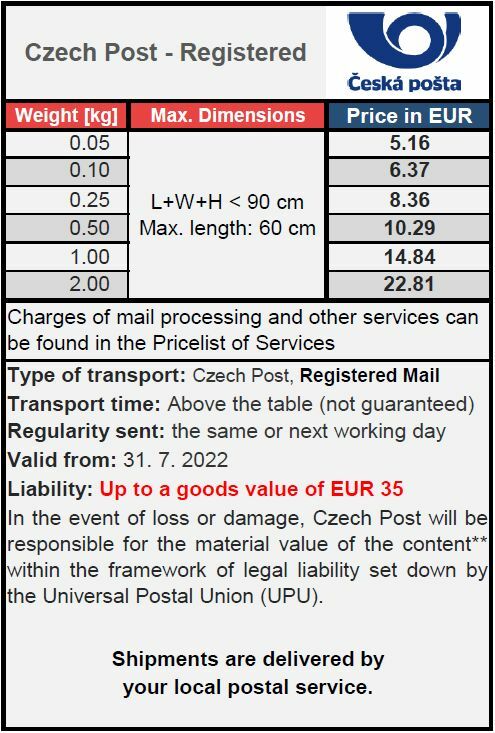 Czech Post - Registered Mail (slower): for small and less valuable things up to 2 kg at very low postage. EMS (recommended for express shipments): EMS is an international postal Express Mail Service, for documents and merchandise. Your item will be carried as fast as possible and delivered within the guaranteed delivery time after arrival to the destination country. Usual transit time: more than 14 days (economy). Usual transit time: 5 - 15 business days (priority), more than 14 business days (economy). 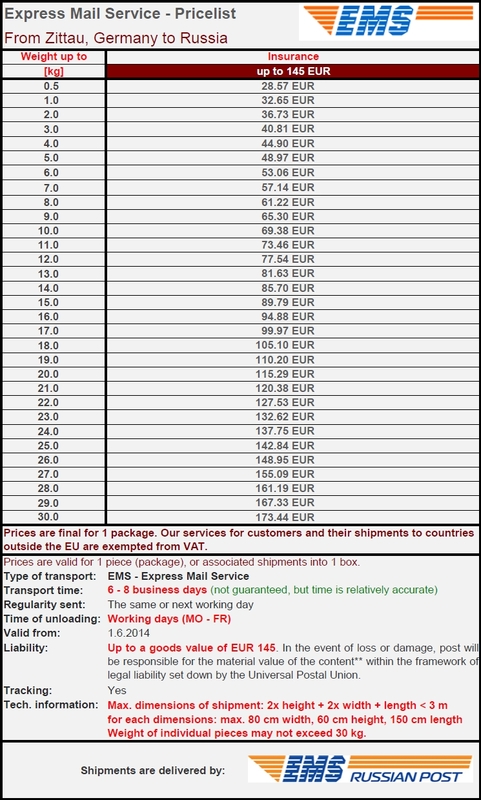 Usual transit time: 4 - 10 business days (priority), Economy and Ordinary delivery is not offered to Russia. An ideal choice when speed needs to be balanced with economy. EMS is an international postal Express Mail Service, for documents and merchandise, offered by postal operators of the Universal Postal Union (UPU). Your item will be carried as fast as possible and delivered within the guaranteed delivery time after arrival to the destination country. Once posted, International EMS can be tracked&traced. Includes liability of up to EUR 145 in the case of loss or damage and shipment tracking.